Diagnosis and Surgical Treatment of Patients with Mirizzi Syndrome. Nazirov F.G., Akbarov M.M., Nishanov М.Sh. Introduction. Among patients undergoing cholecystectomy, the Mirizzi syndrome (MS) occurs from 0,06% to 5,7%, and it is a difficult problem in all stages of diagnosis and surgical treatment. To make a correct diagnosis in the all modern methods, surgical intervention may be done in less than in 12-32% cases. Materials and methods. From 1994 to 2016, 122 patients with MS (20 to 84 years old, on average 50,9±0,5 years old) were operated. Patients were separated by the Csendes classification of MS. Taking into account the development of diagnosis system, the choice of tactics and mode of operative treatment, all patients were divided into two groups. Control group including 69 patients were operated from 1994 to 2008 and the main group contained 53 patients operated from 2009 to 2016. 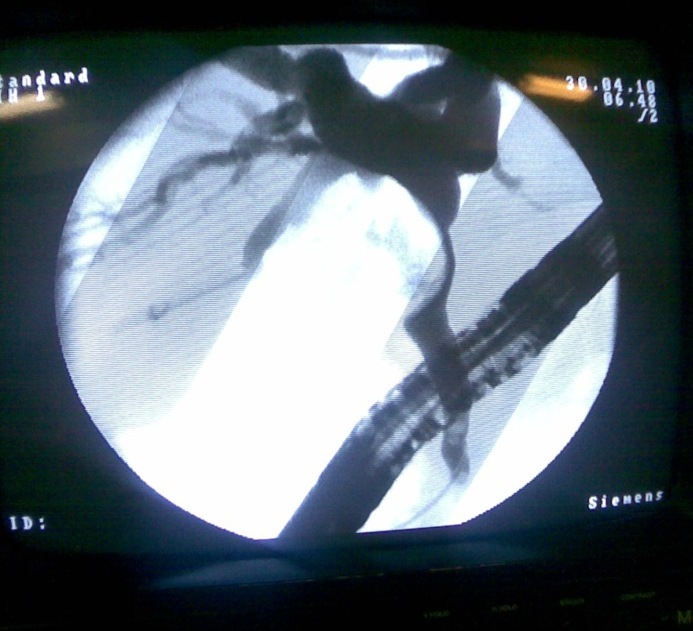 On a number of clinical and laboratory methods of investigation it was applied modern instrumental investigation methods such as: x-ray examination of gastro-intestinal tract, ultrasound investigation (USI), multi spiral computer tomography (MSCT), endoscopic examination of stomach and duodenum, endoscopic retrograde pancreatocholangiography (ERPCHG), percutaneously-transhepatic cholangiography. Results. The diagnostic value of USI before operation was in the following: suspicion of I type of MS was noted in 24,3% of patients, in 37,6% of patients it was suspected the existent of II-IY types. On USI before operation in 5,4 % of patients it was verified I type and in 18,8 % of patients II-IY type of MS. The use of MRI and MSCT in MS verification may increase the efficacy of diagnosis particularly in 2 times in the comparison with USI. But, for patients with MS 1 type, this indication remains relatively low and composes only 33,3%. This method of diagnosis is more effective in patients with MS 2-4 type because of exact diagnosis in 75,0% cases. The most detailed verification was noted on ERPCHG in MS 1 type (83,3%). In SM 2-4 type the efficacy of ERPCHG was 81,4%. Uncomplicated post-operative period was noted in 83,0% of patients of main group, while in patients of control group this indication was only 56,5%. Such difference was noted both in indications of lethality (1,9% in main group against 7,2% in control) and in specific complications (15,1% in main group against 39,1% in control). Conclusion. It is concluded that the significant increasing of topical diagnosis level of MS 1 type in main group (till 42,9%), and for patients with MS 2-4 type this indication in main group increased till 19,2% in the comparison with control group. At the same time, stepwise use of all complex of diagnostic monitoring may increase the efficacy of correct diagnosis till 97-99% in patients with MS 2-4 type. In pre-established MS 1-2 type it is more effectively the using of laparoscopic interventions, and in cases of MS 3-4 type a priority remains for the choice of open operations (CHEC+draining of choledocha by Ker). Keywords: Mirizzi Syndrome, Mechanical Jaundice, Ultra Sound Investigation, Multi Spiral Tomography. Nazirov F.G., Akbarov M.M., Ibadov R.A., Khakimov Y.U., Sirojiddinov K.K. Improvement of the technical aspects of liver resections reduces the risk of many specific intra- and post-operative complications. However, post-resection liver failure (PRLF) remains a difficult problem that significantly complicates the post-operative period. To assess the effect of chronic diffuse liver pathology on the frequency of complications of liver resections, the control group of 81 patients, operated in the NSCS Department of hepato-and-biliary tract surgery and in the Department of surgery of portal hypertension and pancreatoduodenal zone from 1998ÂÂÂÂÂ to 2009 was studied. The patients were divided into 2 groups: group A was composed of patients with concomitant diffuse liver disease, namely chronic viral hepatitis and steatosis (53 patients; 65.4%) and group B included 28 patients; 34,6% with no concomitant liver pathology. The PRLF frequency analysis showed that the development of severe complications in the early postoperative period clearly correlated with the presence of diffuse liver disease. In patients with no chronic liver diseases, PRLF occurred in 2 cases (7.1%) after extensive liver resections (2 of 28). In patients with hepatic pathology, PRLF of varying severity developed in 18.9% (10 of 3). After extensive liver resections PRLF developed more than twice as often in the patients with chronic liver disease: 28.6% versus 13.3% (8 of 28 vs. 2 of 13). After segmental resections, PRLF occurred only in patients with chronic pathologies of the liver (8.0%). 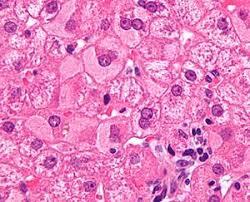 Concomitant chronic diffuse liver diseases caused a significant decrease in the functional status of hepatocytes, i.e. a decline of hepatic extraction fraction in 17.1% (67.5 ± 2.3% vs. 81.4 ± 1.9%) and an increase in half-life elimination of the radiopharmaceutical drop to 26,5% (37.2 ± 1.7 min vs. 29.4 ± 1.2 m) (P < 0.001) in comparison with group В. Thus, hepatectomy in concomitant chronic diffuse liver pathology increases the risk of PRLF associated with reduced functional reserve of hepatocytes and slower compensatory regeneration process. Keywords: Diffuse Changes in the Liver, Post-Operative Complications.